The last several months have been especially busy for me, with July being the busiest. After all July has been my firms (Timmons Group) AutoCAD 2008 upgrade month. Amidst getting deployments ready to be installed and making needed infrastructure changes, a big part of our preparation has been training. Given the fact we have more than 350 professionals throughout our 7 Mid-Atlantic offices, communicating what had changed between AutoCAD 2006 and AutoCAD 2008 was imperative. While preparing for our update training, I came across one book that proved especially helpful. Lynn Allen and Scott Onstott’s "AutoCAD: Professional Tips and Techniques" helped explain many of the newer features inside of AutoCAD. Written as a compliment to AutoCAD 2007, it of course doesn’t cover topics such as multileaders or annotative scaling (both new to 2008). On the other hand it does cover a seemingly endless array of topics making it a valuable read for both beginners and veterans. It’s not often that you find an AutoCAD book that is simple enough for rookie CAD users but also complex enough veteran CAD users. One of the things Lynn Allen is best known for is her unique comedic style that makes the mundane topic of AutoCAD both fun and exciting. After all few books I know of address hard-hitting questions like “How Do You Say Fillet”? Be it Fill-it or Fill-a, AutoCAD: Professional Tips and Techniques is filled with Lynn’s signature comedic style as hundreds of real-world tips and tricks are presented. 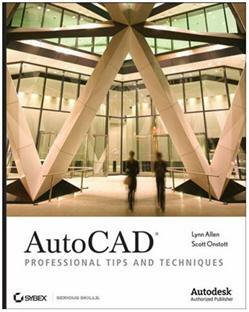 Topics such as fine tuning Windows for AutoCAD, to entire chapters dedicated to annotation, sharing drawings, even the 3D and visualization tools are covered inside this book. At 316 pages in length, this book is not an A-Z how-to for every command and dialogue box inside of AutoCAD. Instead it’s more an A-Z guide on how to streamline hundreds of real-world drafting procedures AutoCAD users face every day. i’ve creating a drawing template with multiple sheets. what is the best way to add drawing title info (rev, title name, number of sheets…etc) to the sheet when it is opened as new. If I understand your question correctly, you want to have a single DWT file that has a bunch of titleblocks contained within it, and want to know how to create a single sheet from that? The way you do that, is to first build a DWT file with all of your titleblocks. With that in place you can right-click on a layout tab, and select create from template. Browse to your DWT file, and AutoCAD will prompt you to select one of the layout tabs contained within the DWT itself.